Yes Milan-San Remo is a Monument! This Sunday, March 22nd, is La classicissima di Primavera in Italy. A race, that once won, becomes a title forever inserted before a rider's name, e.g., "Milan-San Remo winner Alexander Kristoff." Every bike race varies and can be summed up by certain elements: often labeled as a sprinter's race, a climber's race, dependent on the team, all about the type of road surface, or all about the length or route. Milan-San Remo can be summed up by the word Tradition. What makes this race so special? The future is unknown and Milan-San Remo matters. We love to analyze, to guess and express our opinion before an event, as hours are spent discussing how many races a given rider has or has not recently won and how that affects the unknown future. We pick apart the conditions of the last 5-kilometers of the race and determine the top 10 rider's; while doubting that any given rider has it in him to win (how would you like to hear that about yourself before a race?). All this attention swells within 7-days of the race. The winner stands on the podium, we forget and forgive all the incorrect and over-inflated predictions, and pick up the conversation again, with similar characteristics, 358-days later when we cannot remember who the 5th or 6th placed rider was a year prior, but we can remember who won (Alexander Kristoff). I sometimes doubt if the previews are worth a read and the predictions worth a listen - nobody knows who will win, which is all that matters - but anticipation and excitement is at least 40% of the fun of being a fan of cycling. You don't want to miss The Monuments! Is Milan-San Remo a Monument? Yes it is and will always be! More than the route, more than the predictions - Milan-San Remo is a race worth winning. There are only five Monuments in cycling. To win any of the Monuments, boosts a rider's future tremendously through team contracts, endorsements, future jobs upon retirement, respect and a very pretty palmares. Plus there will be rain on Sunday. How awesome! How unpredictable! 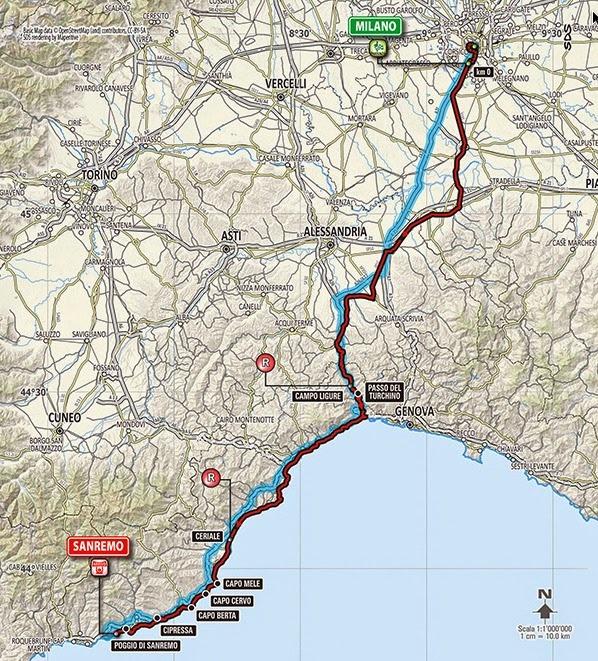 The route of Milan-San Remo changes every year. For most of the big races, the same race preview creators compile what we need to know about any given race. I admire the hours of time and commitment required to put the facts together for fans. I know from writing guides and previews myself that one seldom finds good information on the official race website (Milano-San Remo) until just prior to the race start. You need to know the route and have walked on the roads to predict a race. You need to know the condition of the riders on the roster (announced one-week in advance) and the relation of the riders on each team. For those fans who travel to the race, or who like to read up in advance (to further their own opinions about who will win), these race previews are much appreciated. Although the maps may be the same, the content and opinions are original. I personally like the Team Sky previews, and the work of Mikkel Condé of C-Cycling. Cycling-Tips now reprints his work (with credit!) and Steephill.TV always links to his work. Condé agonizes over getting the facts correct. The Inner Ring used his work awhile back, but The Inner Ring never (or very rarely) gives credit to others who write and contribute to that website, so I am happy to see Condé receiving the attention his work deserves by joining with Cycling Tips, a news source which always delivers honest excellence. Pez Cycling: Milan-Sanremo Preview: La Primavera! The preview I disagree with (and just discovered today): The Recon Ride Podcast: Milano-Sanremo 2015 Pre-race Show. Generally the race is represented by the Italian Milano-Sanremo, and/or the English rendition as Milan-San Remo.